We've combined several of the most popular FMF products for the WR250R and WR250X into a handy package deal. 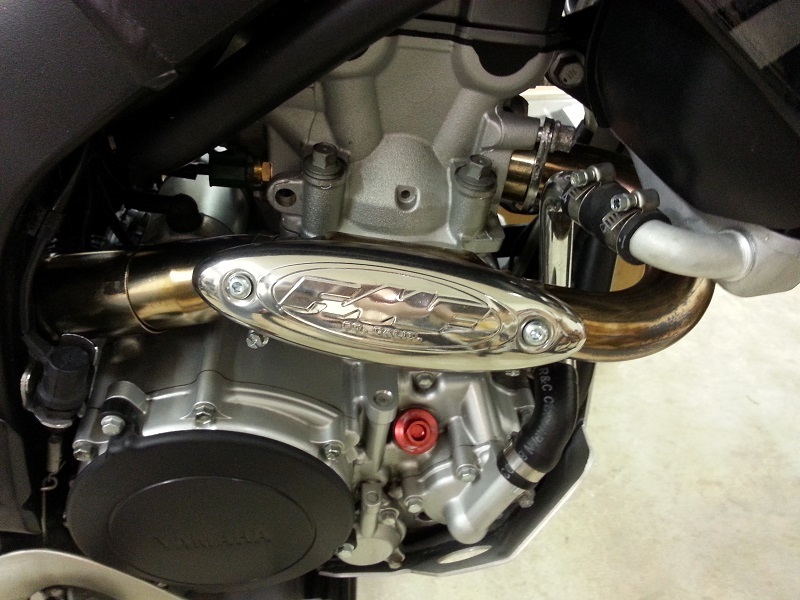 The package is based around the FMF PowerCore4 Hex Slip-On muffler. You can either use your stock header pipe with the PC4 muffler, or optionally add to the package one of FMF's header pipes... either the PowerBomb or MegaBomb. Additional options for the package include an EFI (electronic fuel injection) Controller, which is a plug-n-play device that will help take advantage of your new performance exhaust system. Finally you can also choose to add an EXUP Emulator and AIS removal kit to the package (details below). Header Recommendations: Due to customer requests, we have changed our FMF packages to no longer require that you purchase an FMF header pipe, and instead you can use your stock header pipe with the FMF muffler. That being said, we do however still recommend the FMF header over the bikes stock header.... it is slightly larger in size, and does feature FMF's PowerBulge technology... plus, it just looks much much cooler. We've been running FMF MegaBomb headers on our bikes, and that is our header pipe of choice. It is also the most popular header we sell for these bikes. Sound: The PowerCore 4 Hex Muffler included with this package is slightly louder than FMF's Q4 muffler. If you want an exhaust system that is a bit quieter, the FMF Q4 Performance Package is definitely the way to go. An EFI (Electronic Fuel Injection) Controller is HIGHLY recommended any time you install an aftermarket exhaust and/or air filter on your fuel injected bike, otherwise you will see little to no performance gains, and the bike may even run poorly. At this time, we offer two different EFI options, the EJK EFI Controller or the Dynojet PowerCommander V. Details below. Each are simple to install and plug into existing wiring using stock connectors. ** OUT OF STOCK - This item is currently on backorder.